I just posted about having a type and my long time friend over at 1 Lucky Mama just posted her top three picks. Now, I must admit that her picks are based on more than shear animal attraction and I commend her for not being as superficial as me! I was basing mine on the throw down, and now I am feeling guilty for not thinking with my brain. My brain loves men too, but the men my brain loves and the men my, shall we say non brain, loves are two very different things. I find one man and one man only intellectually stimulating. I might be obsessed and looking through clouded lenses, but he has been my male lead since my teenage years. In my opinion there is no man that has accomplished as much and stayed as humble and grounded. I simply love him and anyone that knows me is aware of my intellectual and emotional lust for this man. He has a clarity that would have made him an excellent teacher (making me hot for teacher). He's been married to his high school sweetheart forever, and I have always respected the way he protects their relationship. He is also a father of four. Here are some quotes he has made over the years. "Distance does not decide who is your brother and who is not. The church is going to have to become the conscience of the free market if it's to have any meaning in this world - and stop being its apologist." "It's stasis that kills you off in the end, not ambition." "My heroes are the ones who survived doing it wrong, who made mistakes, but recovered from them." To be one, to be united is a great thing. But to respect the right to be different is maybe even greater. "Where you live should no longer determine whether you live." "I am a friend to God, a sworn enemy of the saccharine and a believer in grace over karma." The coolest humanitarian ever...and did I mention he's also a rockstar? You were NOT being superficial!!! You do have a "type" and they are great! I'm just silly...and find quirky things that I'm attracted to. AAHHH!!! 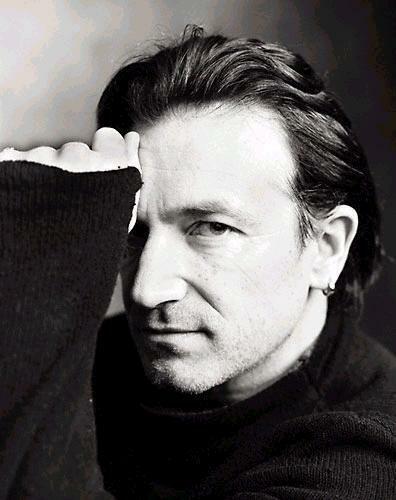 Bono is AWESOME!!! LOVE him! !